Player movement is quite common in the NHL, especially in the era of free agency and lucrative deals. Once in a while, teams are presented with young prospects that may not necessarily fit in with them at the time, and a tough decision has to be made -- let the young guy develop, or move him somewhere else for a player of immediate impact, one of depth or a draft pick. The jury’s still out on Bobrovsky, the slayer of Penguins in Pittsburgh, whose development was hampered by the eight-year, $51-million Ilya Bryzgalov contract. It stung to watch him receive the Vezina Trophy at the conclusion of the lockout-shortened 2013 season, but he came back to Earth the last year, finishing eighth in Vezina voting. When healthy, Bobrovsky’s played at an elite level this season, but he’s been hampered by injury -- including a groin issue that is keeping him out of commission when the Blue Jackets, already plagued by injuries up front, could use him to steady the team from the crease. The young left-handed shooting Finn turned in one full season with the Flyers in their 1996-97 run to the Stanley Cup final, before being dealt to Edmonton just before the 1998 trade deadline for the bulkier Dan McGillis. Niinimaa’s Flyers career lasted 148 games, in which he scored seven goals and 78 points, but may regrettably boil down to that one time he was embarrassed by a Red Wings fourth-liner in the Stanley Cup Finals. He was dealt by Bob Clarke at the age of 22, and played 11 more steady but unspectacular seasons with the Oilers, Islanders, Stars and Canadiens before heading back to Europe. At one point early in the 1997-98 campaign, Niinimaa was listed as a healthy scratch by then-head coach Wayne Cashman. When he found out he wouldn’t be in the lineup, Niinimaa attended a free Metallica concert in the Sports Complex parking lot that afternoon and presented the band with Flyer jerseys. Eaton holds the distinction of being the first player from the Philadelphia area to suit up for the Flyers. Eaton bounced between the Flyers and Phantoms for the 1999-2000 season, recording a goal, two points, and eight penalty minutes with the big club in 27 games. Before getting a true chance to assess his worth alongside fellow rookie Andy Delmore, the Delaware native was dealt to Nashville just prior to the start of the 2000-01 season, where he played for five years. He signed as a free agent in 2006 with the rival Penguins, where he won the Stanley Cup with them in 2009. One two-season stop on Long Island later, Eaton finished his career with the Pens once the league came back from its last lockout. A sixth-round pick in 2007, Maroon was quickly rising through the organization. He was among the Phantoms’ top-five point scorers in 2008-09 (44) and 2009-10 (34), before being jettisoned to Anaheim early in the 2010-11 season. Despite leading the Phantoms at the time of his trade in November of 2010, an ugly falling-out was rumored to be the cause of his dismissal, leading to his being branded as having an "attitude problem." Perhaps not unrelated, then-head coach Greg Gilbert was axed days after Maroon's sabbatical. Currently, Maroon is posting six goals and 25 points with the Ducks after collecting career highs of 11 goals, 18 assists and 29 points over 62 games last year during his first full NHL season in Southern California. Forsberg once was a great unknown: dealt by the Flyers before 1991’s sixth-overall draft pick could even suit up for them in game action in one of the team and the NHL's most famous transactions. Along with Mike Ricci, Kerry Huffman, Chris Simon, Steve Duchesne, now-GM Ron Hextall, two first-round picks and $15 million, Forsberg was shipped to the Quebec Nordiques for Eric Lindros. While Lindros was one of the most exciting and dynamic players to ever don the Orange and Black, he couldn’t quite match the success that Forsberg experienced upon the Nordiques’ relocation to Colorado. And once Forsberg returned to Philadelphia in 2005, the years of wear and tear for proving that Europeans didn't shy away from contact in the corners caught up to him. 115 points in 100 games over less than two seasons paled in comparison to what he still could have accomplished when healthy at age 32-33. Williams was jettisoned by the Flyers 11 years ago in a move to bring in immediate defensive help in the person of Danny Markov, but still continues to make an impact with Los Angeles -- as evidenced by his Conn Smythe Trophy after last year’s Stanley Cup run, supplemented with his NHL-record 14 points in Game 7s. The Flyers’ first-rounder in 2000 (28th overall), Williams was dealt to Carolina after struggling to adapt to systems implemented by Craig Ramsay, Bill Barber and Ken Hitchcock, as well as various injury issues. 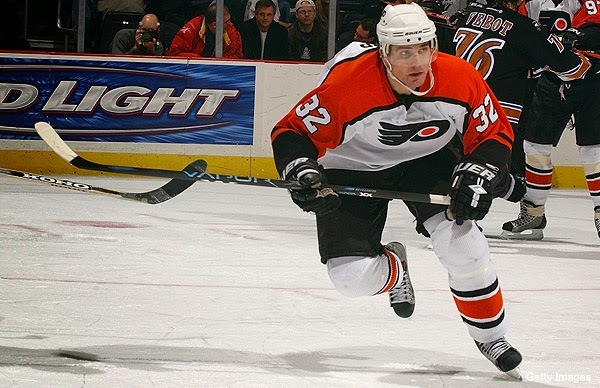 In four seasons as a Flyer from 2000 through 2004, Williams posted 43 goals and 115 points in 226 games. He now has three Cups and rivals Jeff Carter for the longing of Flyer fans who carry grudges over old trades. Honorable Mention: Ruslan Fedotenko is also a favorite, following his 2002 trade to Tampa Bay after posting 33 goals and 66 points in 158 games with the Flyers. He broke out with the Lightning, scored the 2004 Stanley Cup-winning goal (after beating the Flyers in the East Final) and won a second Cup alongside Eaton with the Penguins in 2009. He returned to the Flyers two where he registered four goals and 13 points in 47 games but distinguished himself by closing one of the longest gaps of employment between two stints in Philadelphia. Patrick Sharp is definitely in the mix, especially in the wake of his two Stanley Cup championships with Chicago and Gold medal for Canada in the 2014 Sochi Olympics. However, at the time of his trade in Dec. 2005, the Flyers faced a logjam at center (sound familiar? ), with the likes of Forsberg, an injured Keith Primeau, Mike Richards, Jeff Carter, R.J. Umberger and Michal Handzus. It’s easy to understand how Sharp became expendable, but that doesn’t condone how ridiculous his trade for Matt Ellison actually was.